The National Policy on Education was framed in 1986 and modified in 1992. Since then, several changes have taken place that calls for a revision of the Policy. The Government of India would now, like to bring out a National Education Policy to meet the changing dynamics of the quality education, innovation and research, aiming to make India a knowledge superpower by equipping its students with the necessary skills and knowledge and to eliminate the crunch manpower in the field of science, technology, academics and industry. The Ministry of Human Resource and Development website talks about ‘Themes and Questions for Policy Consultation on School Education. The entire document highlights the changes in elementary education, improving the drop out ratio in the school, strengthening of vocational education, reforming school examination systems, revamping teacher education for quality teachers, accelerating rural literacy with special emphasis on women, SCs, STs and Minorities through adult education and National Open Schooling system to ensure proper education system in the country. As per the document, despite improvements in access and retention in elementary education, the learning outcomes for a majority of children continue to be an area of serious concern. According to a research, children are not learning the basic skills during their schooling. Many children who reach grade V cannot even read and do simple arithmetic calculations. The states are implementing reforms such as early grade reading, writing, comprehension and maths programmes in conjunction with defining and measuring learning outcomes. The NCERT has completed three rounds of National Level Achievements Survey for Classes –III, V, & VII/VIII. States have been given funds to conduct state-level achievements surveys. With Universal Elementary education becoming a reality, near universalisation of secondary education is the next logical step. 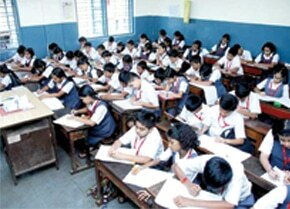 Further, universalisation of quality secondary education implies creating secondary schooling provisions of a defined standard irrespective of the location and management of the institution to accomodate all those eligible grade VIII and grade X students, who are willing to participate in the secondary and higher secondary education. A wide range of centrally sponsored schemes are being run by different secondary school institutions and bodies so as to ensure greater geographical coverage, social and gender inclusion and use of ICT for quality enhancement. A knowledgable and skilled workforce is seen as the most important human capital required for the development of a country. Both vocational education and skill development are known to increase productivity of the individuals, profitability of employers and national growth. Vocational education aims to develop skilled manpower through diversified courses to meet the requirement, primarily in the unorganised sector and to inculcate self-employment skills in children through a large number of diversified vocational courses. Only 7 to 10 per cent of population is engaged in formal sector of economy. The development of vocational education will provide skilled labour force in the informal sector which would further enhance the productivity. Examination reform that focus on problem solving, critical thinking and reasoning skills are critical to improving quality at the elementary and secondary levels. Such reforms will change the teaching and learning processes. CBSE has introduced a wide ranging examination reforms in schools affiliated to it, like for eg the class X board exams has been made optional, a system of grading in place of marks has been introduced. Comprehensive Evaluation has been strengthened so that the students are accessed on an ongoing basis for their holistic development. State Boards have also made efforts to update curriculum and impose examination systems. Quality of teachers has been a major cause of worry in the education system and one of the basic pre-requisites to improve quality. Competence of teachers and their motivation is crucial for enhancing it. Several initiatives are being taken for addressing the shortage in number of teachers, shortages of secondary school teachers in mathematics, science and languages, improving the pre-service teachers and in-service teachers professional development, enhancing the status of teaching as a profession.